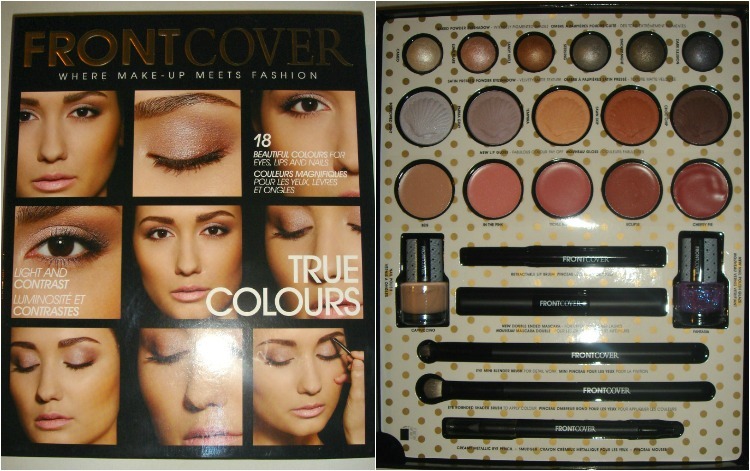 Sophsterlicious • UK Blog: Gift Ideas: Frontcover True Colours Palette. Sorry for the picture heaviness of this post but I really wanted to show off this lovely palette. Meet the True Colours Palette* from Frontcover Coemetics, it is the perfect gift for makeup addicts, or anyone that just loves to wear makeup really, and it would be perfect for someone who is just starting out. I've never been one for all in one makeup sets really but this is different, it is packaged well and it contains such a great selection of products and they are all good quality. The baked eyeshadows are lovely and shimmery and can be used wet or dry and they look lovely layered over darker bases. The satin shadows are a little more sheer but buildable and they work well with a primer. I like the glosses but the annoying thing about them being in the pans in a palette is I can't take them out to touch up my makeup, so I tend not to use them as often - they are smooth and pigmented though. Both polishes are so gorgeous, the purple glittery one is a beautiful topcoat (I'll have some FOTD and NOTD posts from this palette soon). The eye pencil is a good pigmented smudgy one that sets into place and doesn't budge easily. I love both of the makeup brushes so much, the mini blender is a perfect lashline smudger, the shader is like a 239 from MAC and the lip brush is a good lipbrush which has a lid, always a plus in my book! I can't comment on the mascara as I haven't tried it yet, I have too many on the go as it is. You can pick this kit up online for £25, they have lots of others too. Frontcover Cosmetics. wonderful goodies. Wishing you a beautiful day and sending an invitation for you to share your blog at my blog hop today. Hugs!